Often the day-to-day demands of work prevent us from stepping back and seeing how the big pieces fit together. While you might not have the same ecstatic reaction of this guy discovering a rainbow in his backyard, hopefully this post will help you have an even better answer to “what does this mean” (if you can make it to 1:17 in the clip). Capability (competency) model, performance management, knowledge management: many of these terms get interchanged, however, in my experience I have seen distinct and specific applications for the processes as businesses work to maximize their return on investment in human capital. Below the diagram is a quick definition of the terms with links for more information. Business Strategy: While Michael Porter has a longer answer, Jack Welch defines strategy (in his book Winning) as “making clear cut choices on how to compete.” In a previous post, I compiled the 9 Critical Questions on Strategy. Organizational Design: just as form follows function in art and nature (but not chickens), an organization’s structure should follow its strategy. Jaques takes a scientific yet pragmatic approach in Requisite Organization. Capability Model: while purists will prefer to use the term “competency” to emphasize demonstrated abilities (rather than future potential), in either case a model, such as SHRM’s, provides a framework for a hierarchy of skills that can be developed and applied at various levels of the organization. 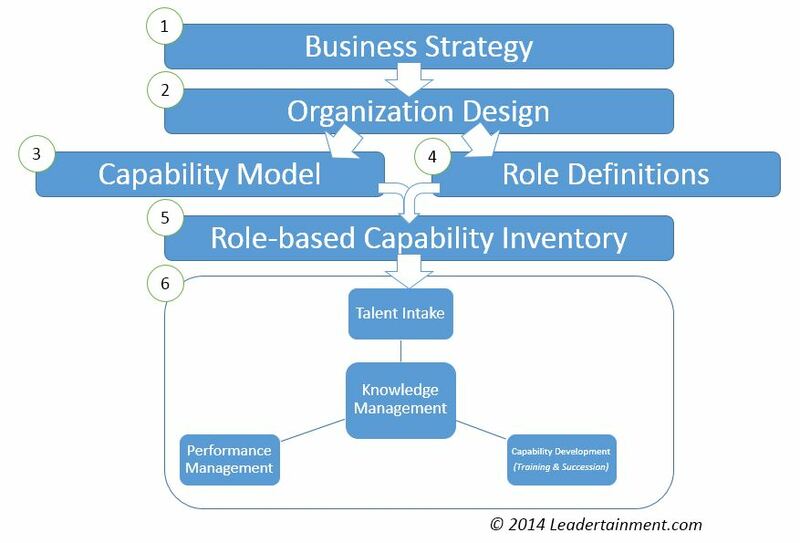 Role-based Capability Model: Combine 3 with 4, and you get an inventory of the capabilities (competencies) required to be successful in each role. This is an essential input to the processes below. Do not pass go, do not collect $89 (after taxes). Talent Intake: defining the requirements for each role will empower your recruiting organization to provide a better slate of candidates for vacancies, and help new hires get up to speed and contributing within the first phase of the talent cycle. Knowledge Management: a central repository for standards, policies, procedures, and other specific “tribal knowledge” accumulated with experience in any organization. A top-notch knowledge management system combines the “push” of compliance with the “pull” of recognition for contributors and highly accessible content (like wikipedia and TED). Performance Management: while a recent duel of data fit models has caught a lot of buzz, an effective performance management process gives employees meaningful, actionable feedback on their performance vs expectations in role, and allows the organization’s leadership to identify high-performing, high-capability players and put plans in place to address staff who are under-performing. Performance review surveys are typically more complicated than they need to be, and the best ones I’ve seen capture 360-feedback quarterly. Capability Development: programs combine training and succession planning to close development gaps identified in any of the above processes. Training can be delivered through self-study, online learning, classroom based training, and on the job coaching. What did I leave out? What other approaches have you seen work also? Leave a comment and let us know. Previous Post Being remembered for the wrong reasons is better than being forgotten. Right? Next Post Does your job fulfill the career Hierarchy of Needs?